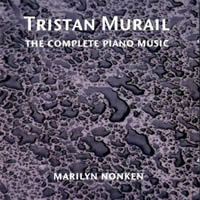 “The Complete Piano Music.” Tristan MURAIL: Comme un oeil suspendu et poli par le songe… (1967); Estuaire (1972); Territoires de l’Oubli (1977); Cloches d’adieu, et une sourire… (1992); La Mandragore (1993); Les Travaux et les Jeux (2003). Marilyn Nonken (pno). Metier MSV CD92097 (2 CDs) (http://divine-art.com/). Debussy and Messiaen live on in the filigree and chords of Murail’s poetic piano compositions. In fact, Comme un oeil suspendu et poli par le songe… (“Like an eye, suspended and polished by a dream…”) was written to gain entrance to Messiaen’s class and Cloches d’adieu, et une sourire… (“Bells of farewell and a smile…”) was written in homage the year he died. On the first disc, Territoires de l’Oubli (“Lands of the Unknown”) towers above the other shorter pieces with its waves of chords and aggressive tendencies. Played with pedal down throughout, the piece reflects Murail’s work with electronics. Apparently it’s not uncommon for piano strings to rupture during its performance. Most pieces, such as La Mandragore, a tribute to Ravel, contrast highly placed melodies, widely spaced chords and rumbling bass lines. The second disc holds the nine-movement Les Travaux et les Jeux (“Works and Days”) commissioned by Nonken. Subtly related to Territoires de l’Oubli, Les Travaux et les Jeux takes an unfussy approach to its interconnected motives. The newer work provides reflective contrast to everything earlier. True to form, Metier captures these atmospheric works and Nonken’s artistry superbly. Morton FELDMAN: For Bunita Marcus (1985); Palais de Mari (1986). Sabine Liebner (pno). Oehms Classics OC 594 (2 CDs) (http://www.oehmsclassics.de/). Distributed in the US by Forte Distribution (http://www.fortedistribution.com/). John CAGE: Music for Piano 1-84 (1952-56). Sabine Liebner (pno). 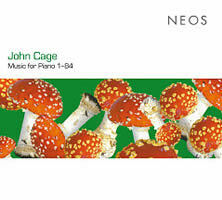 Neos 10703/04 (2CDs) (http://www.neos-music.com/). Distributed in the US by Qualiton (http://www.qualiton.com/). The expansive For Bunita Marcus (63:37 + 24:31) transports the listener to something very much like a luxurious spa. Working calmly at a hushed volume, Liebner’s cool command entrances. The motifs are immediately familiar when they reappear, and the mind savors every slight pitch or tempo adjustment. Significant changes in tessitura and material register like thunderclaps. The inevitable side-change is soon forgotten. Contrasting Hildegard Kleeb’s 71:33 “first recording” on hat ART CD 6076, Liebner’s slower pace attains a higher elevation. 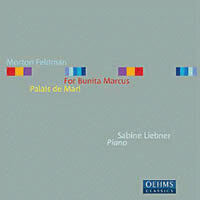 Palais de Mari was also written for the composer’s confidant, composer / pianist Bunita Marcus. She had requested a short piece, but one that exhibited the same methods used in his longer, late works. Feldman’s late-period, esoteric precision contrasts mightily with Cage’s great bear hug with chance. For some numbers in the Music for Piano series, Cage converted his papers’ surface imperfections into noteheads. The 84-piece collection appears like a humongous catalog paged at random with occasional interior sounds and all variety of chords and notes. The effect is nowhere near as restful as Feldman and there’s no intent to produce an attractive line. Given his aesthetic intent, it makes little sense to criticize Cage in those terms. But it’s also evident that Liebner achieves greater expression with Feldman than with Cage. I wonder which is more satisfying to play. Joseph MARX: Six Pieces (1916); Herbst-Legende (nd); Carneval (nd); Canzone (nd); Die Flur der Engel (nd). Tonya Lemoh (pno). Chandos CHAN 10479 (http://www.chandos.net/). Distributed in the US by Naxos (http://www.naxos.com/). Forgotten Marx has been unfairly labeled as the quintessential opposite to Schoenberg and his school. While tonality was clearly Marx’s mien, the captivating 40-minute Six Pieces embraces a vast range of influences. Brahms may come to mind in the Rhapsodie, but the following Präludium (before a Reger-like Fugue) embeds tantalizing whole-tone moments and gently resolving ninths. Somehow, Marx superimposes Debussy’s coloristic effects (Albumblatt) over Brahmsian chord-motion (Ballade). An Arabeske and Humoreske edge towards Scriabin and exotic touches of music-hall waltzes. Premiered here, the four unpublished pieces are small moments, pleasant encores after the grander Six Pieces. Lemoh establishes these pieces as her own. “Beethoven #3.” Ludwig van BEETHOVEN: Sonata No. 1 in F minor, Op. 2, No. 1 (1794-95); Sonata No. 2 in A major, Op. 2, No. 2 (1794-95); Sonata No. 3 in C Major, Op. 2, No. 3 (1794-95); Sonata No. 4 in E-flat Major, Op. 7 (1795-96); Sonata No. 12 in A-flat Major, Op. 26, “Marcia funebre” (1800-02); Sonata No. 13 in E-flat major, Op. 27, No. 1, “Quasi una Fantasia” (1801); Sonata No. 14 in C-sharp Minor, Op. 27, No. 2, “Moonlight” (1801); Sonata No. 22 in F Major, Op. 54 (1804); Sonata No. 23 in F minor, Op. 57, “Appassionata” (1804-06). Paul Lewis (pno). HMC 901906.08 (3 CDs) (http://www.harmoniamundi.com/). Ludwig van BEETHOVEN: Sonata No. 1 in F minor, Op. 2, No. 1 (1794-95); Sonata No. 2 in A major, Op. 2, No. 2 (1794-95); Sonata No. 3 in C Major, Op. 2, No. 3 (1794-95). Maurizio Pollini (pno). DG B0010399-02 (http://www.deutschegrammophon.com/). 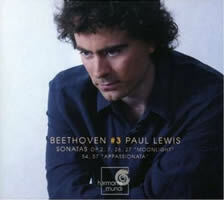 It’s hard to talk convincingly about Beethoven’s piano sonatas if one can’t actually play them. Consequently, my remarks will remain forever amateurish. On these pages I’ve indicated preferences for Serkin and Pollini and by implication, Schnabel. But now Lewis’ 4-part series jumps to the front of the pack. Listening to just the three Op. 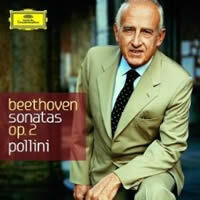 2 sonatas, Pollini emerges as a crotchety geezer who snarls and swipes at every opportunity, bringing unexpected, perhaps inappropriate late-Beethoven torment into these early works. Lewis is quirky, but consistently fluid and vital, with a quicksilver clear touch. Some tempos seem faster than expected, but Lewis consistently invites pulling out the music to explore for oneself. 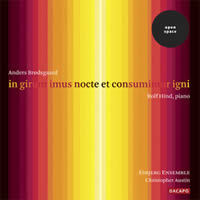 “in girum imus nocte et consumimur igni.” Anders BRØDSGAARD: Joker (1990); Attacca (1992); Requiem (1992); PyroMania (1994); Bacchanal (1994); 7-9-13 (1992); Hymn (1994); Piano Concerto (1994-95). Rolf Hind (pno), Esbjerg Ensemble, Christopher Austin (cond.). Dacapo 8.226514 (http://www.dacapo-records.dk/). Distributed in the US by Naxos (http://www.naxos.com/). A disparate collection of solo piano works ends where a concerto begins. Brødsgaard employs a system which derives pitch and rhythm from the harmonic series. The seven solos’ titles suggest preoccupations, yet it’s hard to pluck them out. Joker opens upon a minimalist’s shop but soon drifts elsewhere. Quoting Beethoven at its start, 7-9-13 implies an intricate Nancarrow-like rhythmic strategy. Hymn employs Messiaen, but soon wanders into free jazz. Brødsgaard’s one-way meandering works best in the concerto, which amplifies contrasts. The opening’s feathery harmonic vocabulary prompts an association with Spectralisme, soon abandoned for robust cresting and a bold finish. I’m obliged to point out the title, a Latin palindrome, which translates as “We enter the circle at night and are consumed by fire.” Hind, who labors convincingly throughout, proves most satisfying when joined with Austin and the Esbjerg Ensemble.